Saturday, February 2 was Groundhog Day. How did Flor and I celebrate? We went to an ASL funcion at Sea World! Everything was translated into sign language! 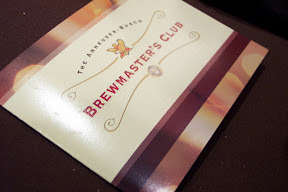 Very cool, and after walking around we ended up hitting up The Anheuser-Busch Brewmasters Club for a little beer tasting. Interesting experience to say the least. The day was a lot of fun as was watching Flor and Lindsay learn new sea-related words in sign and it was cool seeing all the people signing to each other everywhere we went. Check out this sweet translation! Woman Signing at Sea World's ASL Day from Brian Mounts on Vimeo. I ended up taking my camera with me and I went crazy taking pictures. Here they are over on Picasa Web.